Get a third umpire in your ERP system ………….Howzat? Oh boy! I am writing this cricket oriented blog at a time when soccer fever has gripped the entire world. At the outset, allow me to briefly explain what an umpire is. This will help my friends from Europe & America understand my point of view. (In cricket) An umpire is a person who is not a member of one of the teams, thus perceived impartial and who has the authority to make decisions about proceedings on the cricket field, according to the Laws of Cricket. Typically, cricket matches have two umpires on the field, one standing at the end where the bowler delivers the ball (Bowler’s end), and one directly opposite the facing batsman. However, in the modern game as the technology evolved a third umpire was introduced. The third umpire is sitting off the field in international cricket matches who can make the final decision in inquiries referred to him by the two on-field umpires. Television replays and other technologies like Hawk-Eye are available to the third umpire to assist him in deciding. Third umpire debuted in Test cricket in November 1992 at Kingsmead, Durban for the South Africa vs. India series.On the second day of the test, cricketing sensation and popularly known as the God of Cricket Sachin Tendulkar became the first person to be given out by a third umpire. You can see the historic incident in the video below. But noticeably, the technology was at its nascent stage in those days and third umpire was mostly consulted for run outs. However, technology in cricket progressed gradually and third umpire was also consulted for other cricketing decisions. 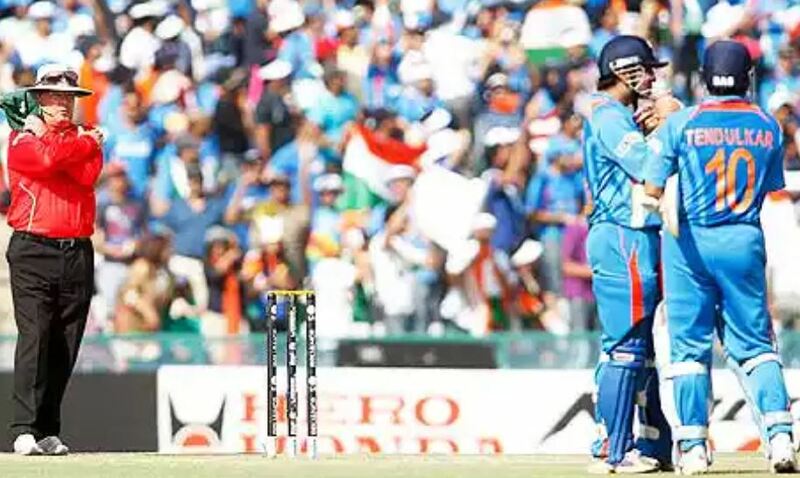 Come 2011, the most controversial match of the cricket world cup played between India & Pakistan. Sachin Tendulkar was given out LBW (leg before wicket) by umpire Ian Gould in the 11th over, bowled by Saeed Ajmal when on 23. However, by this time the tables were turned as ICC allowed players to review the decision of the on-field umpire. So, after much deliberation, Tendulkar asked for a review and replays showed that the ball, delivered from an angle, pitched outside the line of off stump before turning in to hit his front pad in front of middle. 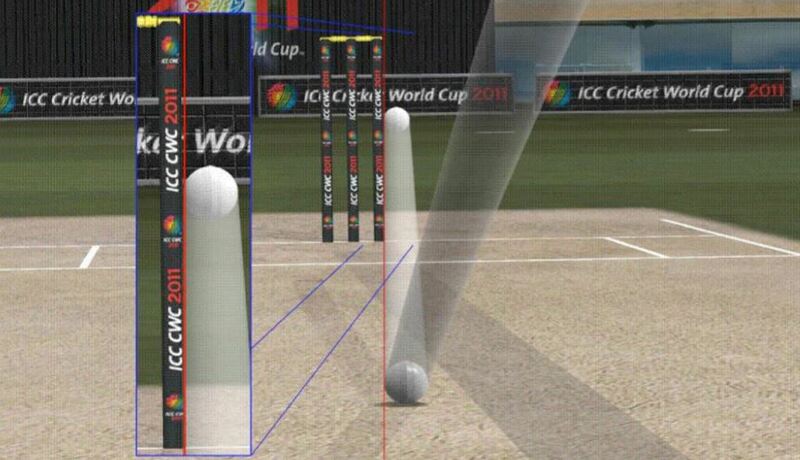 Hawk-Eye suggested that the ball would have gone on to miss leg stump. Indian fans erupted in joy, Sachin Tendulkar eventually went on to make 85 runs and India won the semi-finals. Of course, this was not fathomed by Pakistani fans. The debate that happened after the match is not the purpose of my blog.However, the sole resolution of reviewing controversial decisions made by the on-field umpires was to use technology powered by artificial intelligence to take make accurate cricketing decisions in real time. Simply speaking – taking controversy out of the game. …so do we need a third umpire for the ERP system? Decision support for the on-field umpire is the game changer that aids them to meet the expectation of fans, players, commentators etc. If we see the aforementioned two incidents, we see identifiable patterns with the needs of business/enterprise users who have to make accurate decisions in real time while meeting the expectations of suppliers, engineering, finance etc. This understanding of decision support powered with AI/ML in cricket leads us to the true meaning of ubercool “Intelligent ERP” that SAP (S/4HANA) can provide to business users. Today’s systems of record have been overhauled by new systems of intelligence, which deliver automation, contextual collaboration and AI. IDC calls this enhanced ERP portfolio “intelligent ERP” and it is the spine of digital transformation. The word intelligent is used in so many contexts that one tends to believe it is yet another buzzword with less substance. I do not believe that is the case with S/4HANA. Intelligent ERP is the natural consequence of the technological advances of today’s era. Intelligent ERP is the natural consequence of the technological advances of today’s era. Trying to judge if Sachin Tendulkar is LBW out in a cricket stadium filled with 65,000 Indian fans and millions watching on television is certainly a rare and an exceptional situation in the life of an umpire. Isn’t it? In such a situation, the margin of error is thin. So is the case for a Purchasing Manager , one hand (s)he has to ensure compliance while on the other hand (s)he has to optimize the purchasing cost. Particularly post the economic crisis of 2008/2009 there is tremendous pressure on Procurement teams for cost optimization and compliance. As a consequence, purchasing manager like the on-field umpire needs to be assisted should there be an exceptional situation. S/4HANA CE 1802 introduced the new situation handling framework – a proactive system that shows problems requiring attention and that automatically deliver all relevant information and actions in one place.. You can read more about Situation Framework in this blog. Cricketing decisions have to be made really quick to avoid unwanted interruption to the game. As we saw, the on-field umpire together with the third umpire armored with technology had to collaborate seamlessly. Similarly, one of the jobs of a purchaser is to rationalize the cash discounts offered by suppliers. Whenever a supplier invoice is blocked for payment, the responsible purchaser must resolve the underlying issue swiftly by collaborating with the account payable expert. To ease this , S/4HANA Procurement team shipped this innovation in 1805CE providing a predictive model.You can further read about this innovation here. Free text purchases or non-catalog purchases provide more flexibility for the consumer to order what is needed. But such a purchasing practice is not free of challenges. It makes cost control and reporting cumbersome. This discourages some firms to allow for free text purchases, while the ones who allow have to find ways to convert free text purchase into catalog purchase. 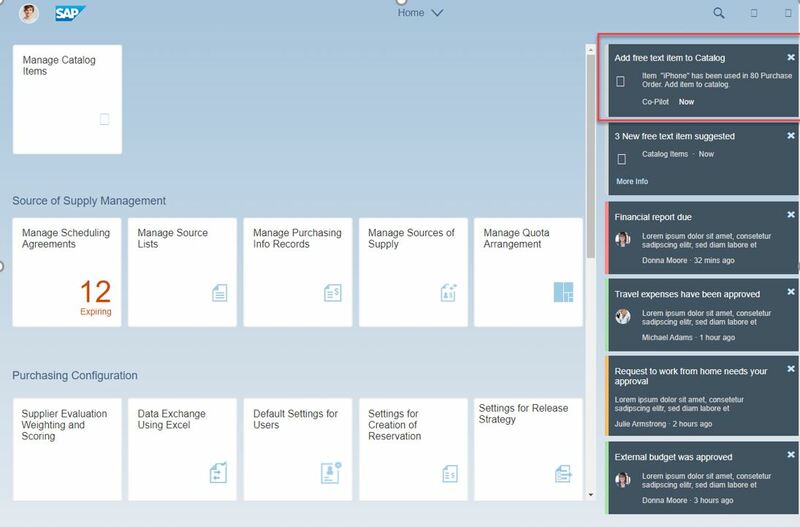 With this innovation S/4HANA procurement team has made the life of purchasing manager slightly easy by proposing him/her when will be the right time to add an item to the catalog. This proposal is based in a machine learning algorithm. Sachin Tendulkar as a player could also use the technology via the review of the on-field umpire’s cricketing decision just to ensure if it was accurate. Similarly, when employees go for free-text purchases they have to provide a material group. Employees are naive about the terms like material group. As a result (in practice), often a wrong material group is assigned while placing a free-text purchase request. This makes the follow-on process time consuming and inefficient, which obviously can cost dollars on scale. So what if the employees are provided technological assistance to provide a material group which is as accurate as possible? 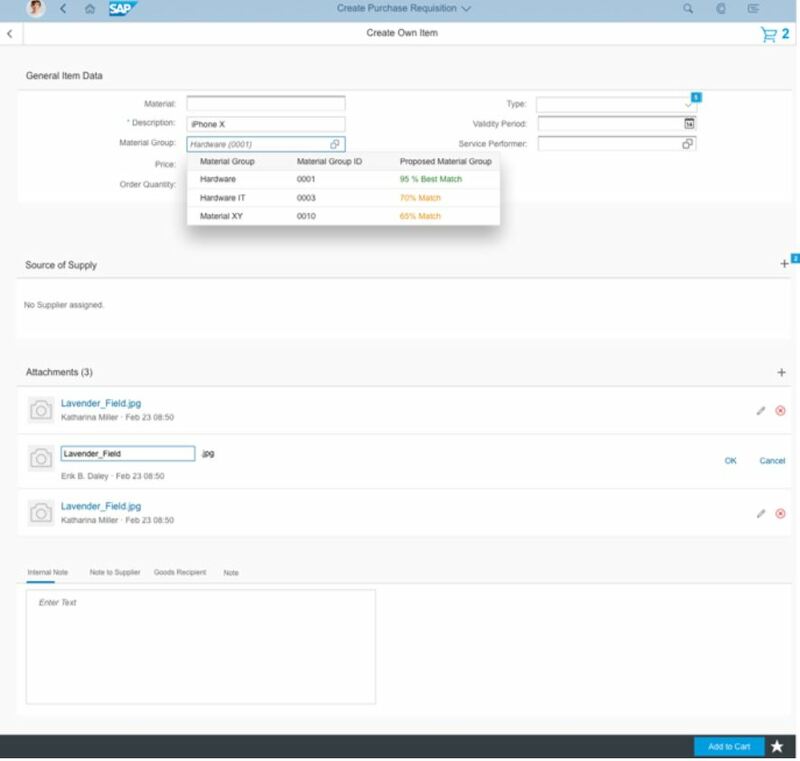 S/4HANA Procurement team has infused the free-text purchase request form with a machine learning algorithm that will propose the employee the most probable material groups that can be used. One key element for an intelligent ERP is machine learning. So, it is no surprise that you see so many innovations starting with S/4HANA CE1805 and many more to come. I wish to conclude my personal point of view by congratulating our engineering team to bring the innovations to market and helping customers believe that “Intelligent” is not a buzzword but there is serious business behind it. Nevertheless, this is just a beginning. Time to get a third umpire in your ERP system ! Intelligent ERP is not a sprint, it is a marathon. Thanks Julien for the additional information.